Like many of my fellow lifters, I had been reading about the Reverse Hyper exercise promoted by Louie Simmons and his Westside Barbell powerlifters. I wanted to try this exercise, but had neither the money nor the space for a specialized reverse hyper machine. So I used what the equipment I had available and came up with a setup that has worked well for me. 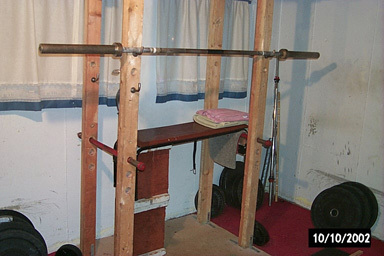 Here is the setup in my basement gym. I already had the squat rack built a long time ago. I picked up the bench at a garage sale for $5. I have a couple pieces of carpet between the bench and the rod on the right side. I have a foam pad folded up underneath a towel for extra padding and to get a few inches extra height. The blocks under the bench on the left are blocks I made out of 4x4s for doing pulls and deadlifts from just below the knee. They worked out to be just about the right height for this. Next I attach some weight to my legs. I am use 2 25lb plates here. I run a belt around each leg and through the center holes in the weights. I also fold my sock down to make it a little thicker so the belt doesn't dig into my ankles so much. I have the weights secured as tight as possible. I punched a couple extra holes in the belt at the right distance. NOTE: You will end up ruining your belt using it this way, so don't use your only dress belt. I used a belt that fit me when I used to have a 32" waist (I don't think I'll be needing that belt again!). This is the starting position. I have to get up on my toes to get onto the bench. As you can see, there is a good stretch on the very lowest vertebrae of the back, which is the main benefit of this exercise. This is the finishing position. I like to bend my knees a little. It keeps the stress of the knees and also keeps me from hitting the wall with the weights or my feet. I started out with 25 lbs on this and have worked up to as much as 95 lbs for 7 reps. You may want to start with no weight or with 10 lbs to see how it works for you. My current routine has me doing these in the morning five days a week. I do 5 sets of 5-8 reps with either 50 or 70 lbs. I do some ab work after this, and my morning workout is done. Once a week, I'll do these heavy as part of my afternoon workout. Since doing reverse hypers regularly (about 4 months) I have had minimal back soreness from any workout, even after a heavy RDL (Romanian Deadlift) workout or heavy cleans. In addition, my RDL top triple has moved up 25 lbs and the pull off the floor in my cleans and snatches has been much easier. From my experience, the reverse hyper is a great exercise for targeting your lower back, glutes, and hamstrings. I would advise all lifters to find some way to work these into your routine.